The seven books are getting a makeover with more than 200 new illustrations in enhanced e-books made for Apple devices. More than half of the illustrations are animated or interactive. They include such touches as a golden snitch from Quidditch matches flying away as you tap it on the screen. 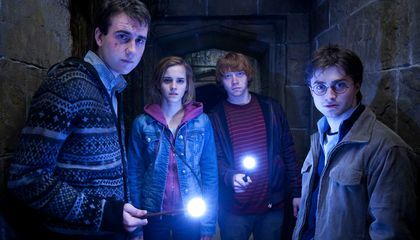 Series creator J.K. Rowling also goes deeper into some of the characters and story lines, with a handful of pop-up comments. The editions were released Oct. 8. They are limited to Apple's iBooks Store. They require an Apple Inc. mobile device or a Mac computer to read. For other devices, including Amazon's Kindle, standard electronic editions are available. They can be obtained through Rowling's Pottermore site. The makeover offers readers a new way to engage with the story. It also gives Rowling and her publishers a chance to resell these best-selling books. The last one came out eight years ago. It's similar to Hollywood releasing the same movies in new formats and with bonus materials. While the illustrations are new and exclusive to the enhanced editions, Rowling's comments aren't necessarily so. Rowling has been regularly posting new essays on Pottermore. She has traced Harry's roots to a 12th-century wizard and has written about the origins of an invisibility cloak that appears throughout the series. Rowling has also written additional books. They include "The Tales of Beedle the Bard." It's a children's book that was referenced in the last "Harry Potter" book. Until recently, the Pottermore site also had a game that took readers through the books chapter-by-chapter. It had riddles and other discoveries along the way. That game included clips from the "Harry Potter" movies. The new e-books do not. In one animation, you see multiple letters fly in through the fireplace with news of Harry's acceptance to Hogwarts wizardry school. In another, an owl, a cat and the fog come to life on Platform 9 3/4. That's where a Hogwarts-bound train awaits. On the train, you see landscape moving by through a window. There's no sound, though. When Harry's friend, Ron, gets an angry audio letter from his mother, you see steam coming out. But you don't hear her screaming, as you do in the movie. You can access Rowling's additional materials by tapping a quill icon embedded in the text. For instance, you learn how students arrived at Hogwarts before train service began. Some rode on broomsticks. But that was tough with trunks and pets to bring along. There aren't many comments, though. You get more backstory at the Pottermore site. But you need the e-books for the full text. The books also get new digital covers to showcase each book's theme. For instance, there are serpents for the second book. Artists also designed a new font with each letter including a lightning bolt. It is in the shape of a scar on Harry's forehead. This font is named Fluffy for the three-headed dog in the first book. It is used for the opening letter of each chapter. J.K Rowling might feel the need to add to Harry Potter because it gets her more money through an all new way of reading the books. In the last paragraph, it states, "The books cost $10 each, or $70 for the series." This shows that the new addition to Harry Potter will bring in a lot more money. I found this article interesting because I am a fan of Harry Potter, though I didn't know about these new book designs. This sounds a lot like the Pottermore stories. They have interactive animations and when you click on things you can get items. The only difference is that there's music and sound effects on Pottermore. WoOow, $10 for an ebook?? That's a little outrageous. As soon as I saw the title of this article I automatically thought of my one friend who is in love with the Harry Potter series. I can only imagine her excitement with reading these makeover e-books. I'm sure she has already had her fix of the Pottermore site. The new e-book has more information and it seems more interactive. 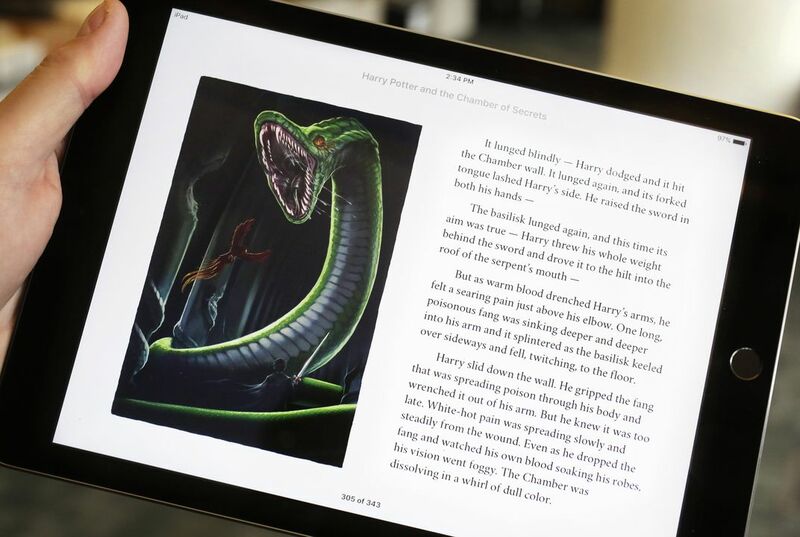 J.K Rowling might have made this e-book so harry potter fans don't lose interest in the book. and she might have made it so you don't get Bord of just reading now you can actually be it the harry potter world and be more engaged. Neat article for those people that do not know a whole lot about this movie. I liked the article very much. I have been a huge fan of Harry Potter books and movies, so i would like these e-books, but with how expensive they are I might not be able to buy it. I also think that the reason that She made new versions of the books is because the franchise is outclassed by other movies and books, like star wars or star trek, so the amount of people still interested in the books is declining.